Today, just a little tip for a midweek blog! 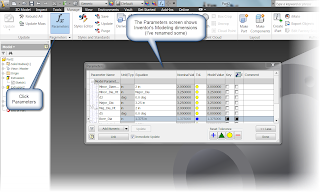 Most of us are familiar with Autodesk Inventor's Parameters. 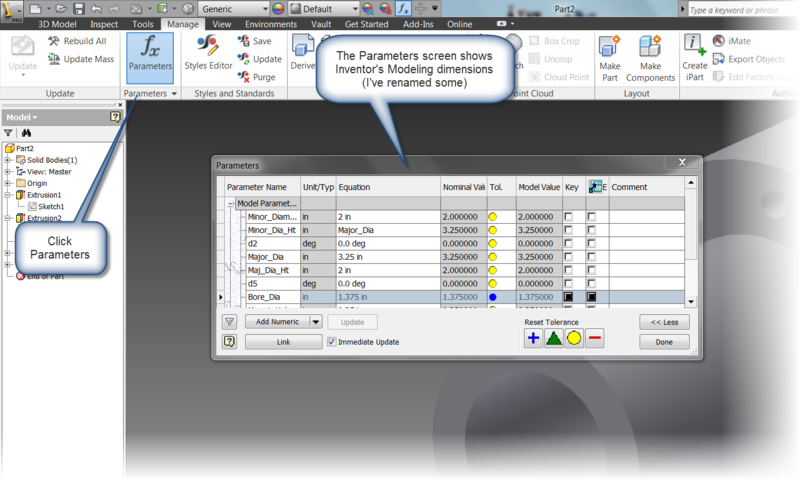 It's where Inventor stores the dimensions that it uses to create it's components. 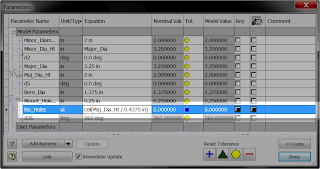 If you've used parameters before, you might even know that you can rename the parameters to give it more meaningful names than the defaults. 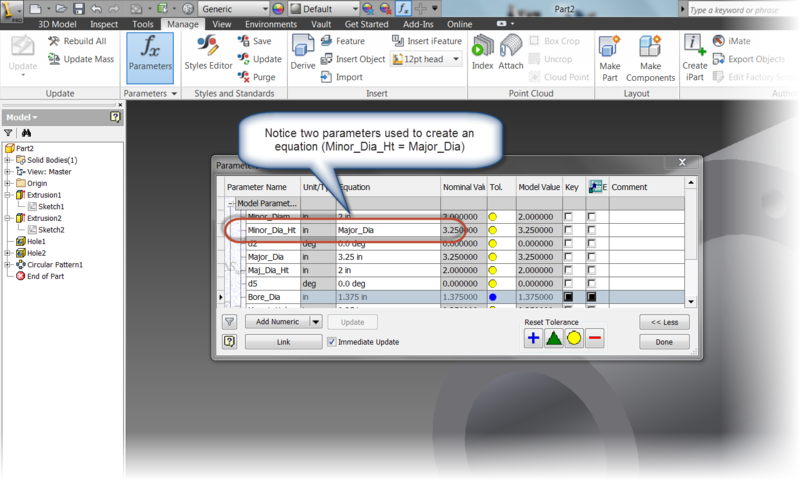 An additional capability of the parameters is the ability to build equations using Inventor's parameters. Many of us have seen those before too. But what many may not know, is that there are many special fuctions that can be used. For example, the "Ceiling" function can round a number up to the nearest integer, while the "Floor" function will round a value down to the nearest integer. For example, in the equation below : Maj_Dia_Ht / 0.4375 = 4.571 without an additional function. 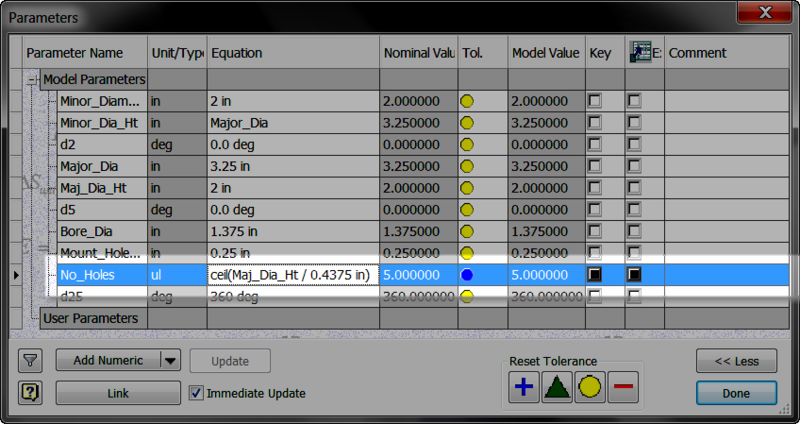 But add the "Ceiling" function: Maj_Dia_Ht / 0.4375 in = 5.0 because this function rounds up to the nearest integer. Why did I use this function? Because I'm calculating the number of holes in the circular pattern, and this number needs to be an integer (you can't have 4.571 holes in a pattern!). For more information on these functions, check out the Autodesk Wikipedia site! Take advantage of these when building equations! Use the to your advantage!